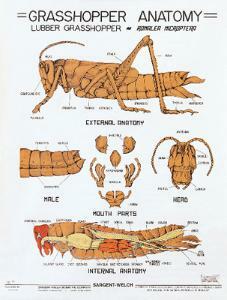 A clear outline of the anatomy of the lubber grasshopper. A lateral view (female) shows external features; a longitudinal section reveals internal structure. With separate drawings of head, mouth parts and posterior of male. Parts are labeled. Size: 48” x 50”, laminated.